The famous Li River, meandering its way through carves in karst landscapes, ancient hills disappearing into the milky distance among scatters of rural villages, quaint shops and local eateries lining narrow lanes, slowly pedalling on a bike or paddling on a bamboo boat alongside the everyday life of the locals. 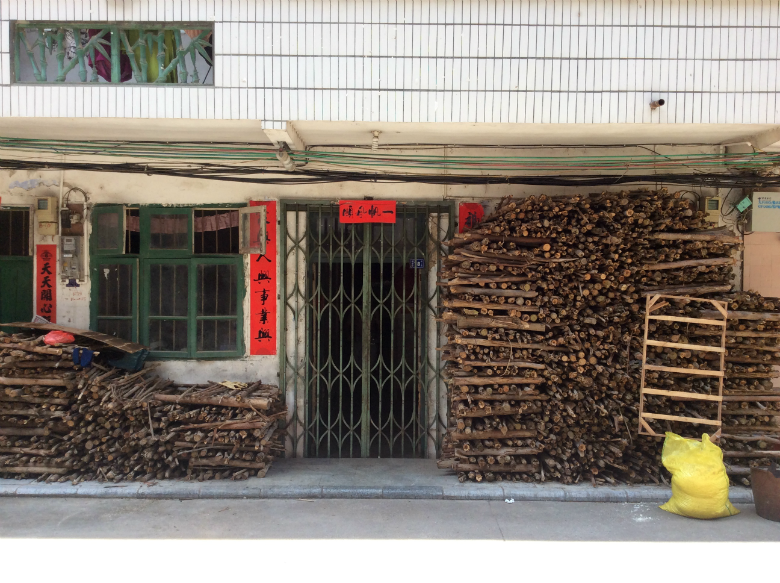 Yes, we thought, this seems like a place to learn more about China’s rural heart. 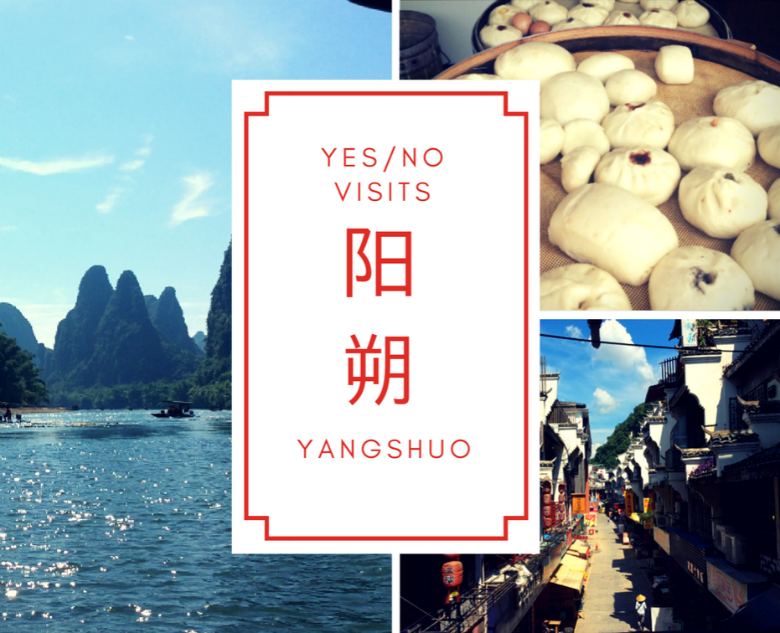 What we actually experienced over our five nights in Yangshuo was something quite incredibly different. Guided to the small town of Yangshuo by a travel tip from a relative who had visited the town fifteen years before in search of the stunning scenery of the Li River – we knew it from that fairly famous HSBC advert of the time, the one with elderly fisherman using cormorants to fish in beautiful metallic waters – we rocked up at the dusty bus station amidst the unfinished construction-site feel of the outskirts of town, rattled from the juddering bus journey along potholed half-roads. 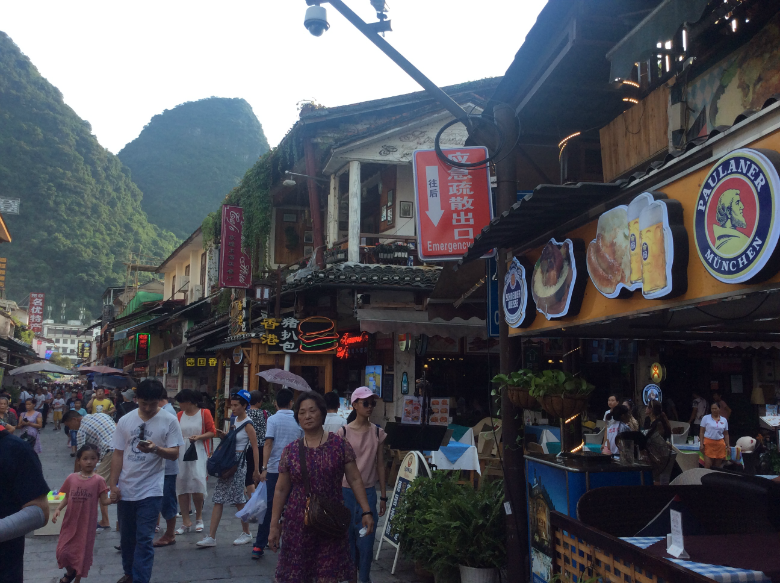 Since the early days in the 1980s when wandering backpackers first found their way to the sleepy streets of the old fishing town, things have changed for Yangshuo in a big way. For better or worse, the Chinese government and locals alike seem to have learnt exponentially just how lucrative tourism can be and now spend their time merrily milking the veritable tourism cow dry, slurping on the double cream it produces and overdosing on the richness. Overdone and overtly shocking, this once small bumbling stop off on the humble travellers’ map has grown into a hulking great big whirlwind of Chinese consumer madness. 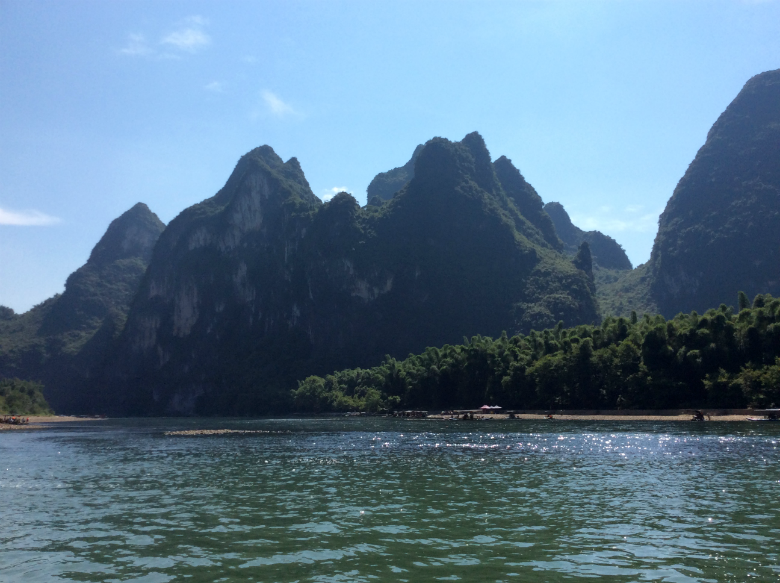 Yangshuo has become gobsmackingly gaudily magnificent. Turning the corner from the main traffic-clogged road introduces visitors immediately to a world of Chinese tourism wonder. A pedestrianised street works as the main artery in the centre of town with many smaller streets leading like capillaries from it. A walk down this street in the evening feels like a cross between a meretricious theme park world and something like Rouge City from Spielburg’s uneasy sci-fi A.I. Bulking and bullish, a moving mass of people slowly saunter and shuffle through the streets, gawping gladly at men in ethnic minority costumes who hammer ostentatiously at chillies or at girls in communist outfits selling ice cream unwittingly to the theme tune of indistinct EDM offensively thumping out from strange clubs wedged between a proliferation of souvenir shops. This human concoction culminates in a bizarre and bewildering scene for overseas visitors to behold—reminiscent, perhaps, of a rowdy strip in a European resort town, apart from the lack of alcohol being consumed, so it's like an orderly madness, a subdued frenzy. 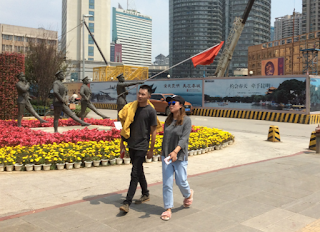 Like a real-time version of Manufacturing Consent, Chinese tourists appear to be blindly following the crowd, pleasantly placated by the act of jamming themselves down the veins of the town simply to wonder – with selfie sticks aloft – at the sheer amount of people alongside them doing the exact same thing and to gaze at the inane activities being played out either side of the crowd from various shops and restaurants. 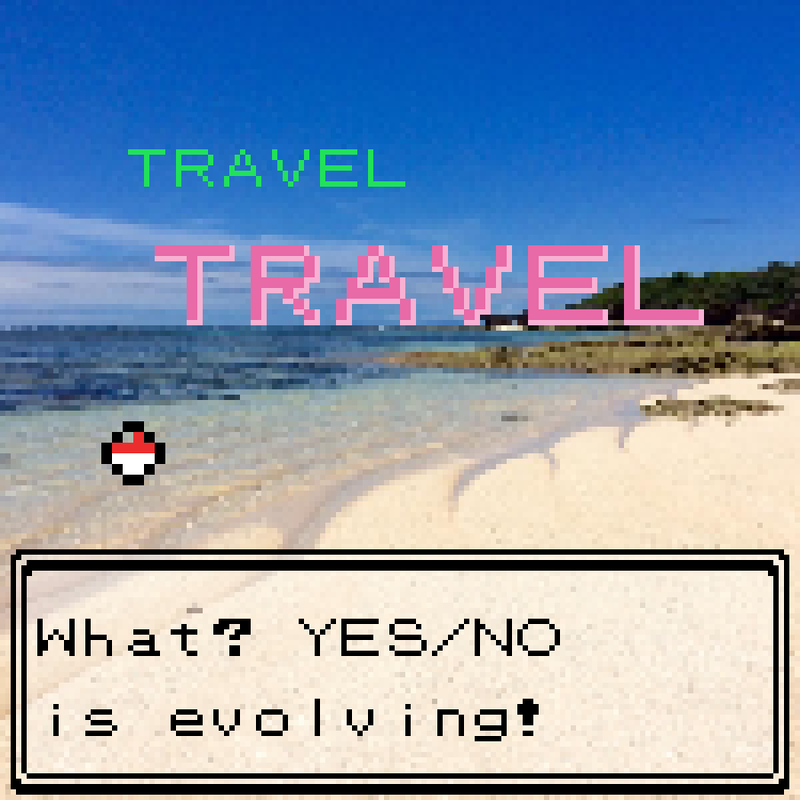 It truly is an incredible sight to see. We walked among the throng of people in pure amazement at what had happened to this once humble village. 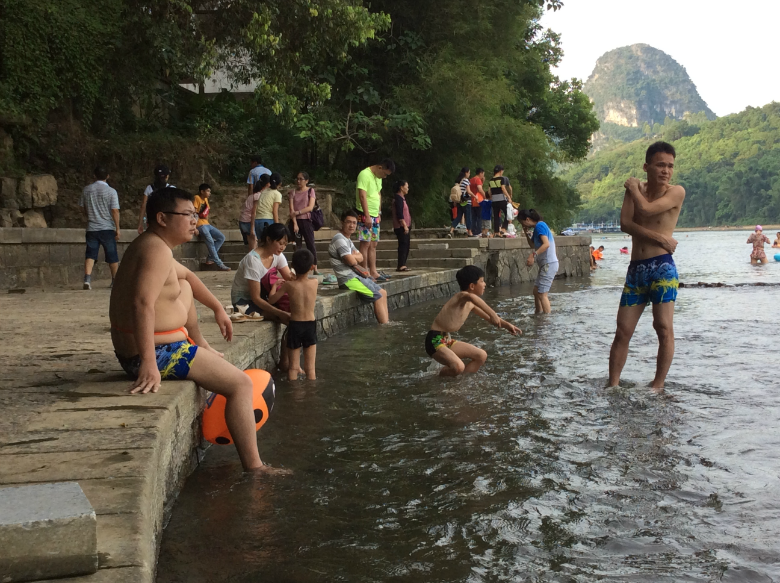 Sitting along the banks of the river quickly became our favourite pastime whilst we were wrapped up in the world of Yangshuo. Away from the droves, time slipped by slowly under the daze of the sun. 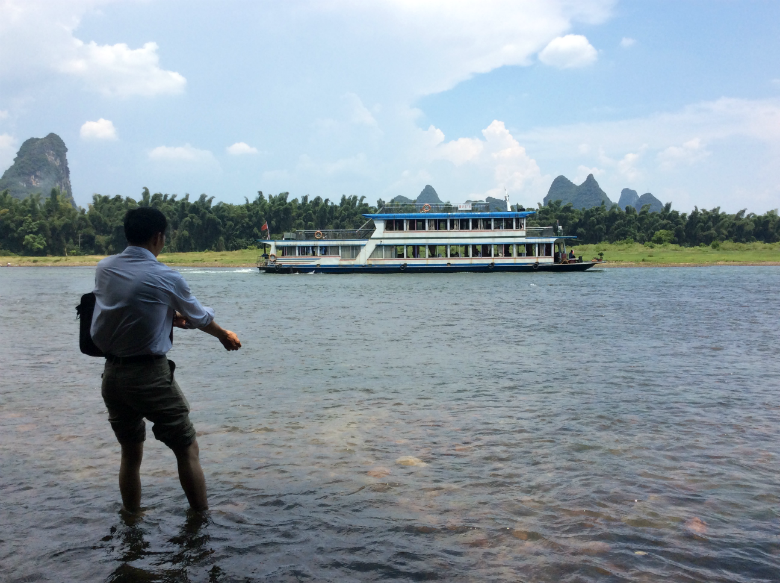 We sat idly, feet dipped in the shallow waters of the Li River, observing. Boats chugged by on their routine courses, Chinese sightseers enjoying a paddle, residents walked their dogs and played with their children whilst a gutsy Western family braved a swim in bikinis and speedos—a hugely fascinating spectacle for everyone around (especially as women don't tend to swim in bikinis in China). 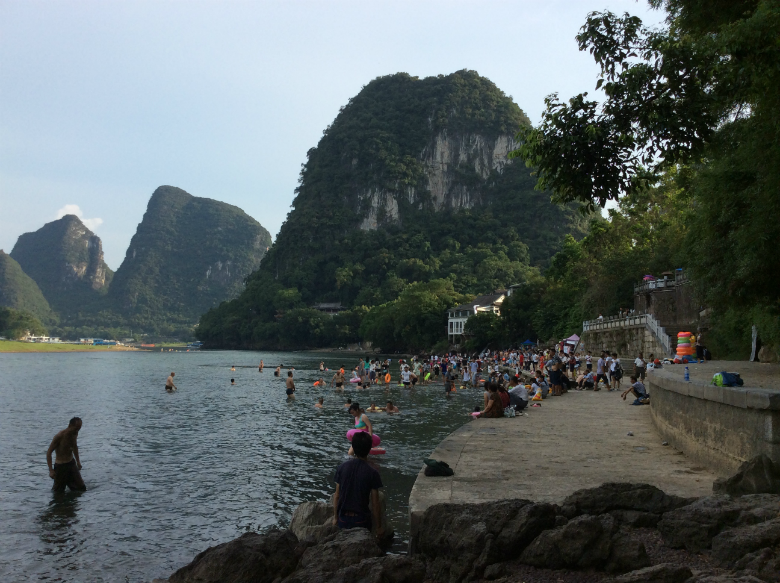 The youthful moneymaking Yangshuo is betrayed here, the dismal streets feeling distant at this peaceful spot along the water’s edge where the butterflies gather. The hours wash along and the old ways of the past appear to persist like illusions we make for our wishful thinking. On the opposite bank a man leads some water buffalo for a drink. A boy washes himself. 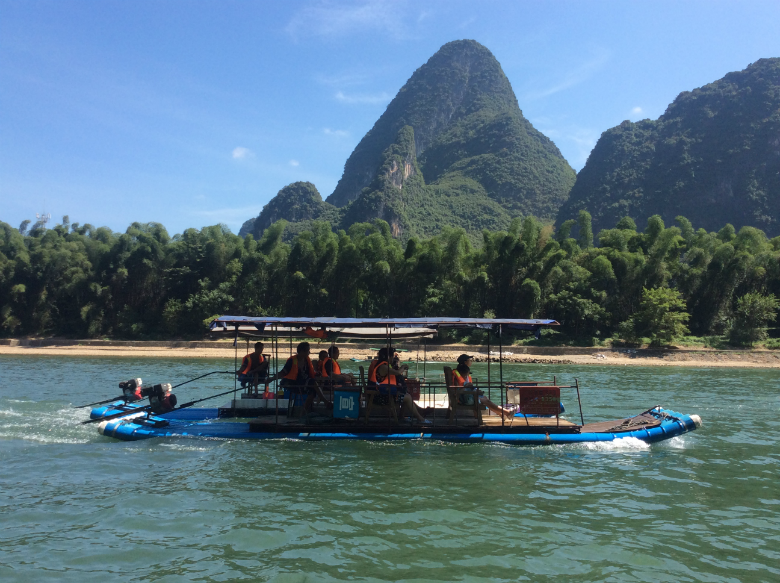 In order to see more of the famed landscape of the Li River we were informed that the The Thing To Do is to go on a classic Li River bamboo raft cruise. 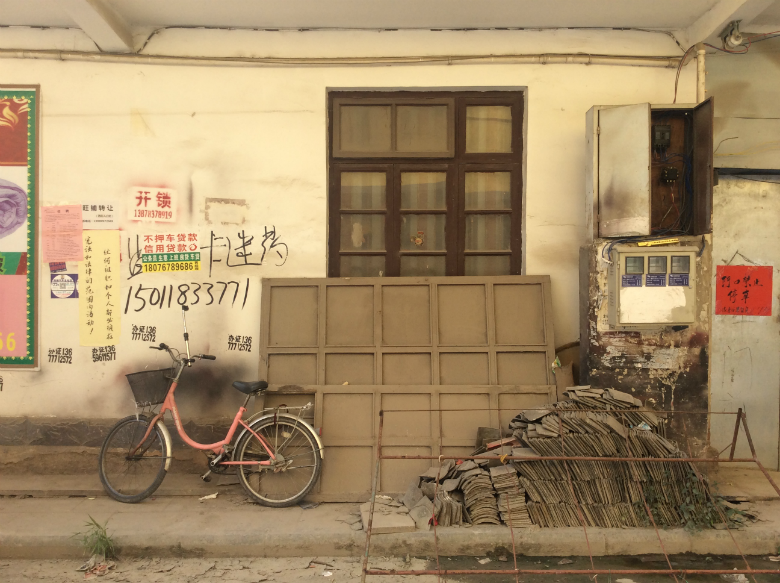 At 8am we were picked up from our guesthouse by a man in a minibus who spoke to us neither in English nor Chinese and had the rough-around-the-edges appearance of a man who had a hundred jobs of which none were in any capacity official. Along the way we stopped off to collect other tourists: a family of three and a grandmother, three young fresh-faced girlfriends and a quiet young couple. And then we were off, steered on a 40 minute whirlwind of a journey, frequently on the wrong side of the road, to the docks. The place to pick up the bamboo rafts - actually made of plastic - was jam-packed with hundreds of Chinese tourists all eager to catch their boat. We were wordlessly paired with the quiet couple from our van who knew a handful of English words. With enthusiastic Chinese hospitality they offered up some fruit from the branch of longans they'd freshly purchased. The girl also bought a cute hat for a few kuai. We bought nothing. The whole quirky event was a very Chinese affair and, even though everyone there was a tourist, we felt like we were learning about China and Chinese society by being there with everyone during Chinese summer holidays. 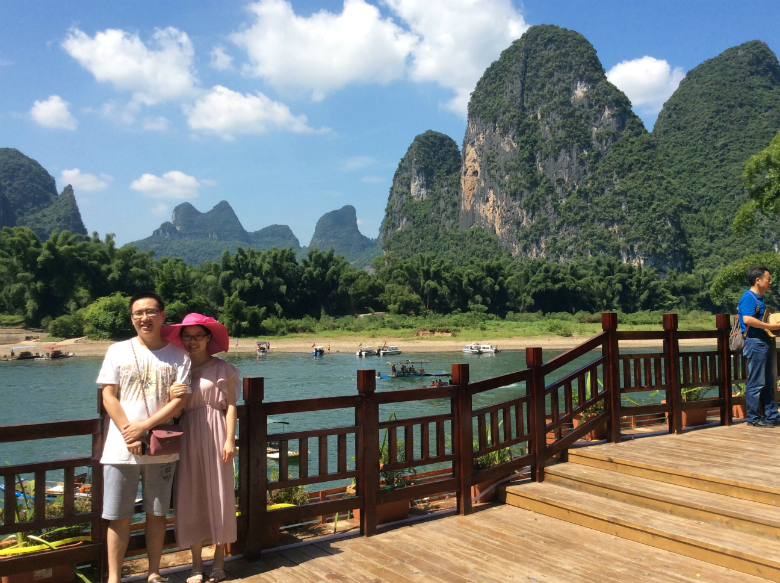 The cruise was laid-back and we were able to see the stunning mountains up close, including the actual bend in the river depicted on Chinese money. Our newly acquired friends got a 20 yuan banknote out to explain this to us. Back in town we were dropped off at our guesthouse run by Mr Wei. 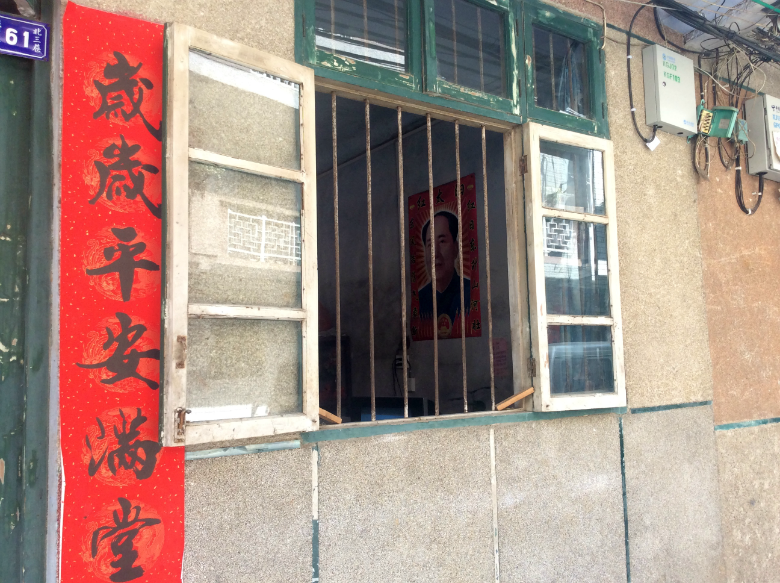 It seems that Mr Wei was an early adopter in the fast-growing tourist industry of Yangshuo, having turned his own home into a 'Culture House' almost two decades ago. Over the years many guests have had the experience of staying in his home and living alongside his family. His wife, an extremely warm and smiley lady, served us up a family dinner one night. We sat around the humble table with Wei, his wife, son, his heavily pregnant daughter-in-law and grandchild, and gladly ate the hearty homecooked food that was offered to us. The unusual highlight of the meal was gnawing on a pigeon's foot and other parts of this small bird. It was a mountain pigeon, a relatively expensive centrepiece for the meal, which also included perhaps for our benefit only a bowl of chips. The ramshackle hamlet that Mr Wei's Yangshuo Culture House belongs to feels suburban and sleepy compared to the town; like a slightly more high rise version of something from a Western film, people slouch inside the cool of their front rooms, reclining with family under the curled cornered posters of Mao, everyday life soundtracked by the latest advert buzzing from the constant hum of a television. An estranged world. A sidestep away from the glaring tourist neighbours nearby. Staying at Wei's and walking the small modest streets where his children play was fascinating, unfolding glimmers of glorious practises: phone numbers scrawled on the sides of houses, logs chopped up and piled high ready for the imposing winter ahead, washing hung in the shells of half-built houses. The overzealous moneymaking city has this slow-moving settlement in a chokehold, strangling it until finally each house is turned into a shiny hotel or a pizza joint. Life in China is rapidly changing, people are getting richer. The hope is that with new wealth the overall everyday quality of life will improve; the worry is that the quiet serenity of local life will get washed away in a riptide of consumerist haze. 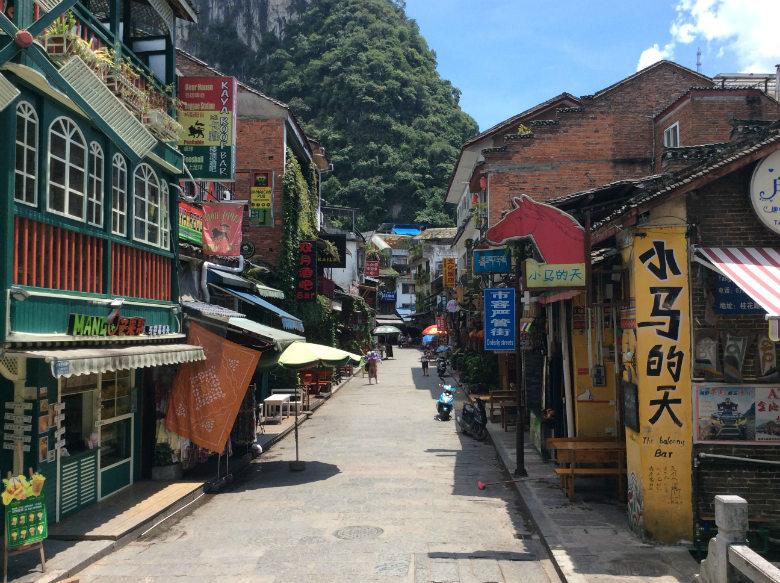 Yangshuo is a strange, intriguing and sometimes terrifying town. It's a window into a world of Chinese tourism and rapid urban development that you may want to run away from at first sight. 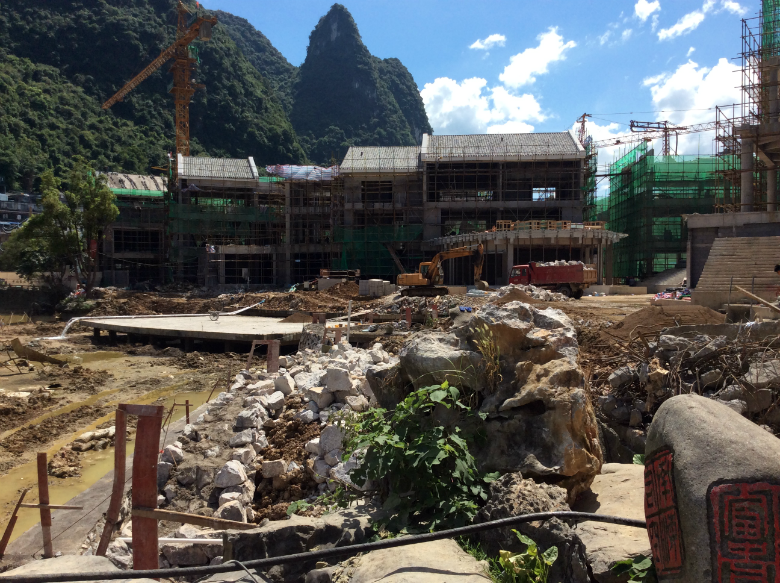 A large area of mud and construction we passed by every day is now, less than nine months after we visited, a large fully functioning mall. China is stopping for nobody. However, ultimately the experience leaves you with more of an understanding of modern day China. This town isn't built for learning about Chinese history, but instead, as it moves by proxy of its tourism into the future, it has become a place to learn about the China of here and now and of tomorrow.